Blackstone Audio has been publishing the entire Vorkosigan series read by Grover Gardner. There are several volumes out, and we’ve reviewed a couple of them (The Vor Game and Mirror Dance) before this one. I have little to add to the positive assessment of Gardner’s talent that the other reviews of this series have pointed out; I’ll just say that I enjoy his narration of these books very much. He’s got a dry tone that fits Miles Vorkosigan perfectly. A very pleasant listen. In this particular volume, Miles is called into diplomatic action against the Quaddies, a genetically engineered race that we were introduced to in the novel Falling Free. In that novel, we learn that quaddies are genetically altered humans that have four arms and no legs which is an advantage if you live and work in zero gravity. The only problem? They were treated as slaves by the company that made them, and the novel is largely about their rebellion. Diplomatic Immunity takes place 300 years after that one, and much has changed, though distrust for “downsiders” remains. Vorkosigan is called in when some citizens are captured and held by the Quaddies at their Graf Station. He meets with the representatives of the Quaddie government, hears their side of the story, then proceeds to uncover the truth while preventing a war. Miles Vorkosigan is a fine character. He’s got flaws (and plenty of them) yet always manages to succeed despite them. His personality is entertaining, and the plot of this novel, in which Miles is called upon as both diplomat and detective, is just plain fun. Whenever I listen to one of these, I imagine how good a television series this would make. These novels are not meant to be masterpieces of hard science fiction – they are meant to be enjoyed, and enjoy them I do. I can’t wait to hear the next one, though I feel that listening to them in the original print publication order would add even more to the experience, the main reason being that the Miles I hear in this novel is not the same Miles I heard in The Vor Game, I expect due to events in the novels in-between. 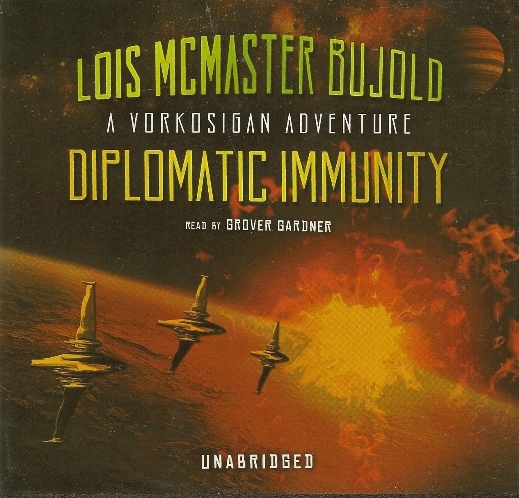 Lois McMaster’s Vorkosigan novels have an interesting history on audio. A company named The Reader’s Chair originally came out with enjoyable unabridged versions read in tag team fashion by Michael Hanson and Carol Cowan. Unfortunately, the company didn’t survive. 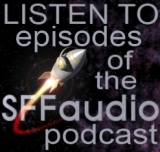 One of the first reviews I wrote when I got into reviewing audio was the Reader’s Chair audio version Falling Free, the Nebula Award winning novel that I spoke of earlier in the review. Click here to see it. I read the book, I haven’t heard the audiobook, but the story is great. But I think it would be a really good idea to do Komarr and A Civil Campaign before Diplomatic Immunity. I think those two books are my two favorites by Bujold, but for different reasons. Komarr because it is really the most “scientific” of her stories and ACC because it is so hilarious, a comedy sci-fi.